Photographer Helen Norman shot our home with her assitant, FJ Hughes, for the Better Homes & Gardens Magazine shoot back in February. We had such a great time and I can't wait to work with them again! Helen is not only crazy-talented but she's hysterical and so much fun to be around. She's one of those people whom you feel instantly at ease around. (clearly my toddler, Christian, agrees- below) FJ is super-cool and very relaxed, and he & his wife also just had a new baby. When Helen first arrived at our house, she checked it out and immediately told me how crazy it was because our kitchens were so alike. 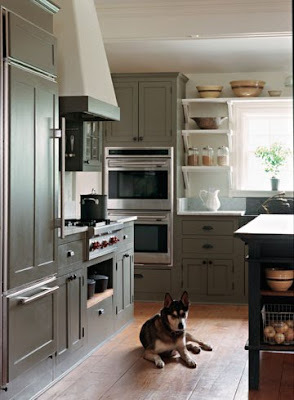 She has the same gray-green cabinets with wite open shelving instead of upper cabinets and a sort of clean-lined modern farmhouse feeling in her kitchen. She informed me that our styles were really similar and she even has many of the same types of flea-market./ thrift-store finds that I have. Joanna told me what an amazing house Helen had so I bugged Helen for pictures- in particular of the kitchen. Well, I got them and now I almost wish I hadn't seen them!!! ;) Her kitchen is basically my kitchen all grown up. (i.e WAYYY BETTER!!) It's everything I wanted for my own kitchen: custom inset cabinets, soapstone sink, marble countertops... I could keep going but never in all my life have I seen a space that I just want to blatantly copy like this one. I just get such a feeling when looking at Helen's photographs. There's so much life and they feel personal and real. Her kitchen feels so relaxed and functional and perfectly simple. How gorgeous are the shelves?? I seriously just want to copy everything in this kitchen. Even her piled up dishes in the sink are beautiful!! EEEEK!!! I die. I thought I wanted a white kitchen for the lonest time..but lately gray cabinets are calling out to me. This kitchen is stunning. I'm plannning a remodel of my own so thanks for the inspiration (I'm on a tight budget though which means my wish list has to be pretty flexible!). But I have to tell you, I think I first arrived at your site when I saw YOUR rather amazing kitchen makeover and considering your budget and time constraints, it is still one of my favorite rooms. Period. You did an incredible job creating a beautiful space for your family and I'm sure it will continue to evolve into the kitchen of your dreams. And, I, for one, can't wait to watch you work your magic. 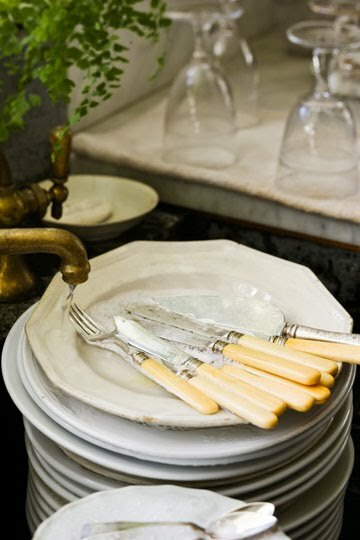 What a cool styling trick, the piled up dishes in the sink. . . how great is that, and fab post as usual! Ahhh...It looks so relaxed...un studied...so beautiful. LOVE the sink...below the window. 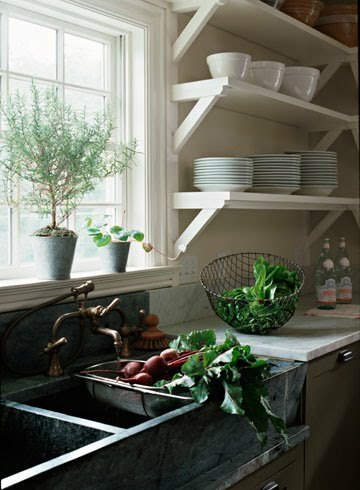 Sometimes simple is very nice...it looks pretty and neat and with the window overlooking the green it is adding more flavor to the kitchen. i am in love! every detail is so finely edited and classic. even the kitchen stool top matches some of her pottery. and it certainly helps to have a room in the hands of a talented photographer. That truly is gorgeous. Wow. Can't wait to see her website. I'm linking to your blog in my post today because (speaking of copying), I copied your idea with the chalkboard paint under our new mantle. Thanks for the great idea! There is a funny photo (which my friend sent to me)of piled up dishes and the baby in the sink....I thought of immediately when I spotted that sink. Well, Helen's work speaks for itself and I think both kitchen's are fabulous. You are both talented and unique! LOVE Helen Norman's kitchen!! And adore the double faucets in the soapstone sink. What a great kitchen. I usually like brighter colors, but even I like it! I love marble counters, but I'm not brave enough to do it. Never even occurred to me to do a soapstone sink. So many thoughts after looking at these pictures, I'm a little scared to see her entire portfolio! Her work and website are awesome! Beautiful kitchen. Great light. 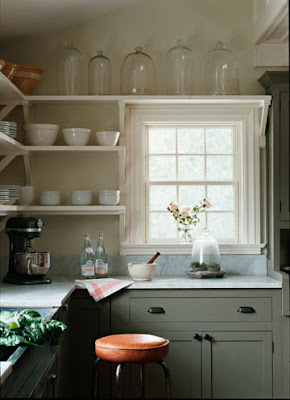 I love a kitchen that looks so warm and homey but sleek and super-organized at the same time. The floor alone is fabulous! I say "copy away!". 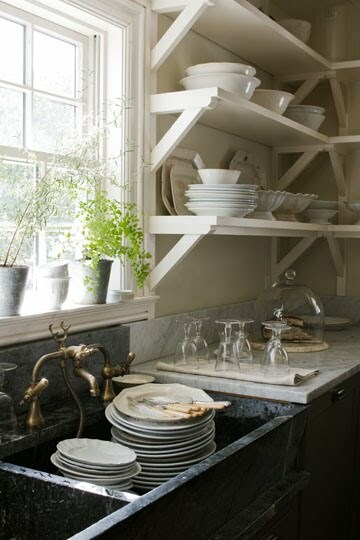 White shelves and white dishes. Glass domes are fantastic and have always wanted to own one! Love the topiary in the window! I can see why you are so smitten. It does look like yours! Love your kitchen still Lauren! I'm wiping the drool off my chin as I write this... the kitchen is so comfortable. The colours, finishes and accessories are lovely. I just popped over to her website and her work is stunning. She is such a rockstar. 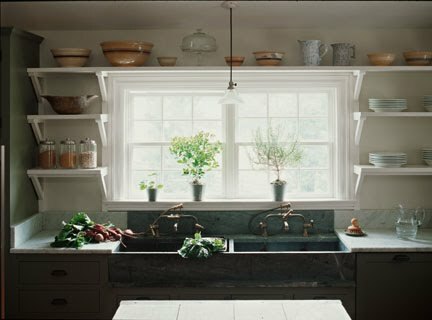 Her work on Martina Arfwidson's house (pic 23 in her interiors portfolio) for Martha Stewart is one of my favorite interiors series. She is so talented. I can't wait to see her depiction of your home. It sounds like you had a stellar team with her AND Jessica Thomas! Absolutely gorgeous, I could actually like cooking:-) in a kitchen to bright and stylish. I love this look!! Beautiful, beautiful work and web-site! I wanted to sit in the interiors, eat the food and visit the resorts!!! I just can't get past those fantastic taps!! I am in love with this kitchen! Thanks for sharing her kitchen and her website...very talented. I love your kitchen as well, though. You have done such a great job and by yourselves to boot! Equally impressive. BTW, I passed on a little blogger award to you this morning. Helen's kitchen has been extremely inspirational to me for a few years now. Her style greatly influenced my kitchen...we did the open shelving over tile (tile just up, shelves not on yet) and honed marble counters. We ended up going white though because of the way the rest of the house worked out. So fun to see some different images, the dishes in the sink are great! what's not to love about farmhouse kitchens? I just posted your blog post on my Facebook fan page. ajphotostylist. I don't know how I missed this post yesterday Lauren but that kitchen is going into my inspiration files asap! I gasped when I saw this post! This is the inspiration kitchen I used for our kitchen - for open shelving, windows over sink, cabinets...My copy was torn out of a magazine though and it's wrinkled and folded as I showed it to a lot of contractors! LOVE her style! I, too, am in love with her kitchen, and yours! I'm sure you say it somewhere, but what is the cabinet paint color? It's exactly what I want in my kitchen. Thanks so much!!! Okay, yeah, how do you seriously make dishes in the sink look awesome? I'm sooo impressed!! !